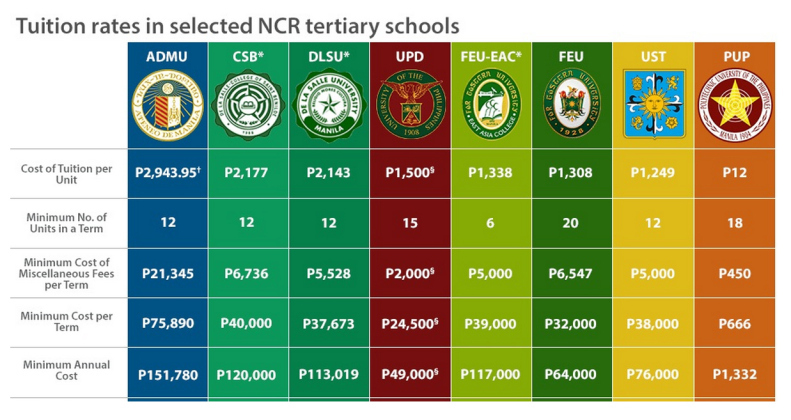 While browsing my FB last night, I have just noticed this inforgraphics of the tuition fees of leading colleges / universities in Manila. I just can’t help but be proud to myself that I graduated from the Universities which has a very low tuition fees yet has a very good education system. Imagine during my Academic years I’m paying roughly around 300 pesos only for my 21 units subjects, Isn’t it amazing! I’m very thankful that PUP still maintain the same affordable tuition fees despite increase in all basic commodities. Children are entitled the right for education, but how can we give good future to our kids if only few can afford good education. Of course we love to go to prestigious School like Ateneo, DLSU and UP, but how about those families who have enough only for their food. I hope the government will build more Universities and Colleges like PUP which offer very affordable Tuition Fees. A lot of student will be benefited specially the low income families who’s their children are very eager to go to college to achieve their dreams.We are living in a fast paced world. We need to mold our children to be globally competitive. Let’s shape the leaders of tomorrow.